GENMA, part of Rainbow Heavy Industrial, has been keeping busy recently, with the supply of two of its GHC100 mobile harbour cranes to Myanmar Industrial Port (MIP). These units were shipped from Ruitai terminal in Jiangsu in China. Myanmar Industrial Port (MIP), one of two major container ports in Myanmar and a key trade gateway, which was founded with the guidance and assistance of the national Head of State, more than 300,000 twenty-foot equivalent units (TEUs) annually or 40% of the country’s container traffic handled by it. 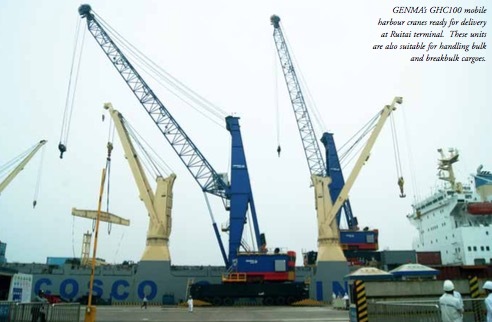 Under this contract, the two GHC100 cranes are mainly being used for container handling, but they are also suitable for the handling of bulk and breakbulk products. The maximum capacity and operating radius of the GHC100 is 100 tonnes and 48m respectively. The maximum travelling speed is 4.5km/h . Besides this, the anti-sway control technology, storm-proof design and lower-down ability of the tower can further guarantee safe and efficient operations, which is especially appropriate for the local environment. According to the solution design and simulation analysis, the two GHC100 cranes will help improve operational capacity by almost 20%. The installation port for the two GHC100s will be very close to an industrial park, and only 3km from the town. When designing the cranes, noise control was closely considered, and noise emissions conform strictly to the client’s requirements. GENMA is already working on future contracts. These include the delivery of four, single-tube, 400tph (tonnes per hour) HSUS400D pneumatic ship unloaders to Venezuela. The installed multi-stage turbo blower system in these unloaders can increase blower efficiency by almost 20%, and save around 30% in energy, compared with using a roots blower on the unloaders. The brand GENMA belongs to Rainbow Heavy Industries (RHI), which provides mainly bulk handling solutions. These include: mobile harbour cranes; pneumatic ship unloaders; mobile hoppers; floating terminals; conveyor systems; and EPC services. A wide range of cargoes can be handled by GENMA equipment, including bulk, breakbulk and containers. The company strives to remain competitive by focusing on offering creative, high-quality solutions and service. GENMA is headquartered in Shanghai, China. Its manufacturing, technology and R&D centres are in Nantong and Changsha. In order to serve its customers better, GENMA has also set up sales and service offices in Singapore, India, Belgium and Canada. It also has responsive agents in Asia, Africa, South America and the Middle East.